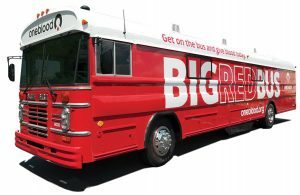 The Big Red Bus will be at Holy Family on Sunday, March 3, from 8 a.m.-2 p.m.
OneBlood's blood banks are low. While the Pulse and Parkland shootings spotlighted the need for blood, the need is year-round (it can take up to 100 pints of blood to help ONE auto-accident victim). You can make a difference. Click here to set up a time to donate. Sponsor Code is 7660.